Because shopping on 34th Street is often an afternoon long jaunt that can leave a girl awfully parched, we would like to let you know about the newest addition joining our 34th Street restaurant offerings: a beer garden. Yes, right across from Madison Square Garden, down the street from Macy's Herald Square, H&M, Footaction, and Swarovski (and perhaps soon DSW), there will be a new, 6,000 square-foot beer garden. 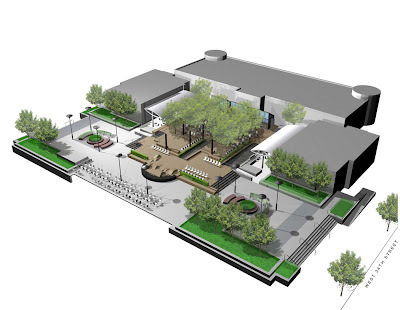 Rendering of the beer garden from Local West. The big building is Duane Reade, Local West is to the left, and on the right is Lucy's Cantina Royale. Pretty, yes? The good people at Local are bringing us shady trees, picnic-style communal tables (as well as cozy 2-tops), 16 different craft beers, a menu of handcrafted soft pretzels, kettle corn, and sausages, all in close proximity to Madison Square Garden and the best of 34th Street shopping. Meet your friends for a nosh, meet the guys before heading to a game, or meet your friends and then meet some guys. It's all good, and it should be opening in early June. Okay, all I can say is that it makes perfect sense to me, one can work up a thirst when pounding the pavement in search of new sartorial selections.